Shop updates. Heywood Wakefield Chair restoration has begun! I am thrilled with the space! I cannot say enough as to how happy I am to have a physical location. I was able to meet a local etsy customer, help her shop and bring her an item to look at that she was considering! With that said, if you plan a visit and there is something in my online inventory you'd like to see, please email me at malissa@madmodworldvintage.com and I will get it there for you, and at me best price! If I am available when you stop, I will definitely try to meet you! Seeing there is a market for collectable pyrex pieces that no other vendors are really tapping, I will be concentrating on curating some nice sets, cleaned and oiled and ready for display. I will be adding a primary fridge set next week. Waiting for the blue dish to come. Last dish is on it's way! Hitting the shop next week! This week found home for my Friendship cinderella mixing bowl set, the turquoise step end table, the yellow hostess casserole and I expect the small bookcase and Bertoia chairs to be picked up today. I also sold a chair online and shipped to California! What a great busy week! Now to figure out what to put into the open space! 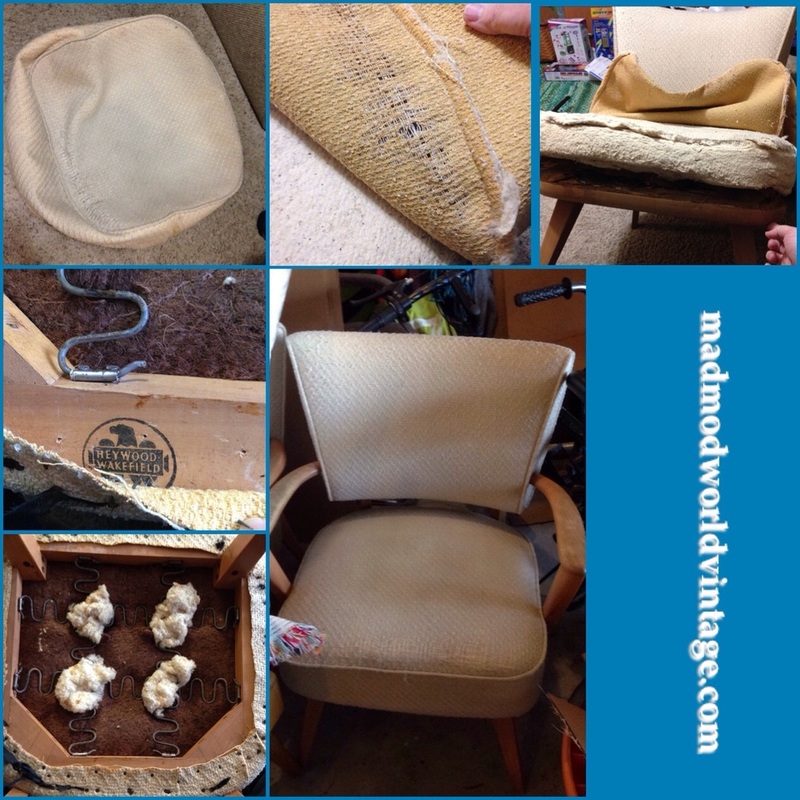 With my Joybird yardage on the way, I started demolition on one of the Heywood Wakefield chairs. Looking forward to making these beautiful! I selected the VIBE AQUA, which is a great color and a sturdy weight. Cannot wait for my mom to work her sewing magic! I started with the worst chair and will be doing some work on the arms thanks to a suspected small doggy's nails! The rest of the wood is excellent though, so if this is the only sanding I have to do, I am happy! There is a similar chair for sale at my antique mall so if this goes well and this pair finds a home fast, I will save that one as well! I do think it is pretty funny that our current perception of MCM does not really coordinate with fabric choices of the era! This floral is pretty gross! 😜👍. 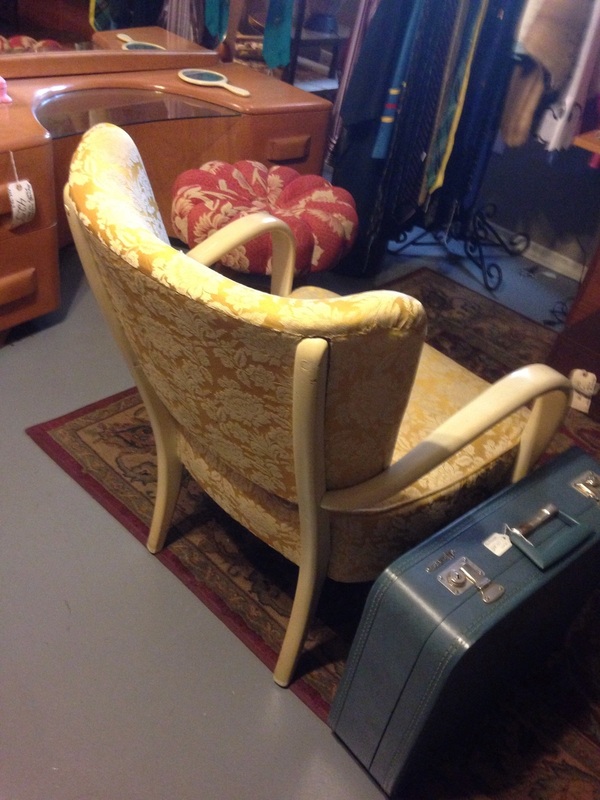 This chair is not something i would want in my house as is, but i think after a strip (wood looks painted) returning it to blond bombshell and a sassy colored upholstery, she will be fabulous! The other chair I would like to save!